Our flexible document bag is used to collect and store documents. It is not only flexible, durable, but also very easy to use. 2. Dull polished surface gives you an impressive sense of touch. 3. This dlexible document bag is suitable for A4 documents. We at Deli Stationery is an experienced flexible document bag manufacturer and supplier in China. Due to our consistent dedication to quality and environmental protection, we have been awarded the ISO9001:2000, ISO14001:2004 certificates. 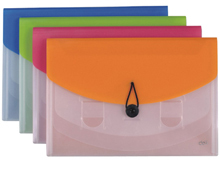 In order to fulfill various needs of our customers, we offer a wide range of products, including file holder, display book file, file box, PP file bag, stapler, paper punch, and more. High quality and low priced, our products are in great demand in countries like the USA, Canada, Australia, Russia, Britain, Germany, Italy, France, South Africa, etc. If you have any questions about our office supplies, please feel free to contact us. We look forward to serving you!